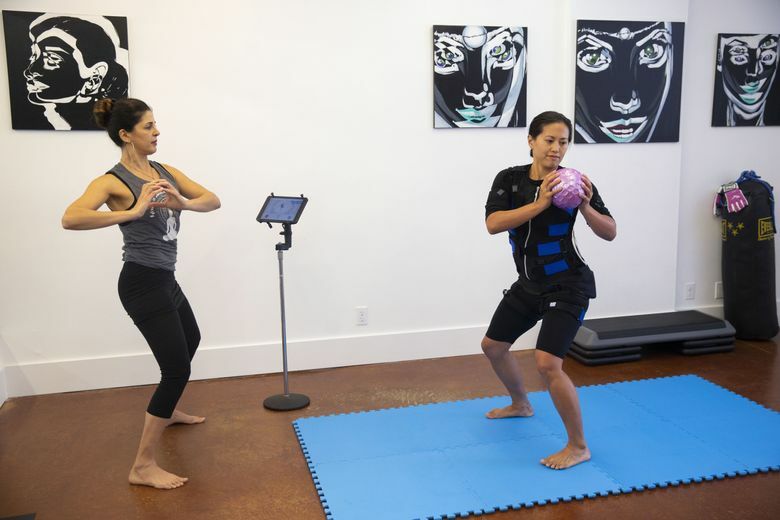 WHEN I FIRST felt the pulses from electrical muscle stimulation (EMS), I thought this workout was like doing squats while getting a massage. Sure, it was an all-over, intense electrical massage, but still, it felt pleasant. That is, until you realize the massage is making the workout harder. Much harder. 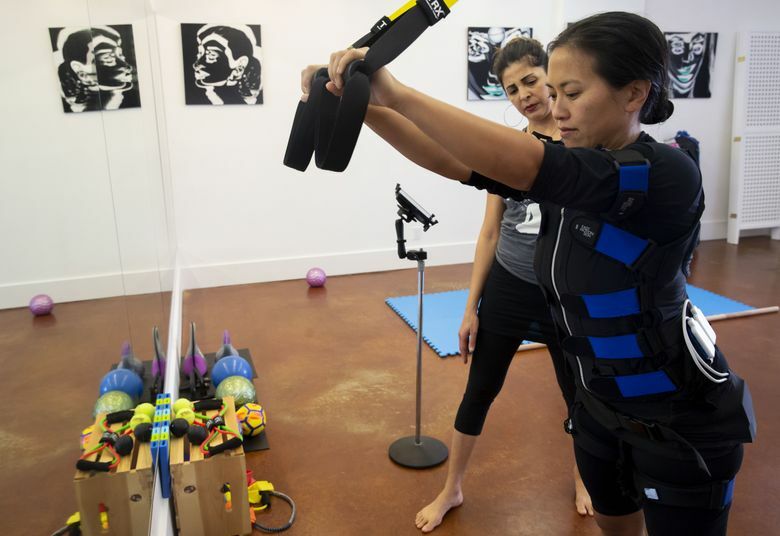 I went to Body By Impulse on Phinney Ridge to try out a session using electrical muscle stimulation technology, which owner Michka Mirzanejad said is popular in Europe, where she came upon it. For the workout, you put on a suit that has been wetted down to help transmit the pulses, plus several straps to target muscles, including your glutes, your arms and your thighs. 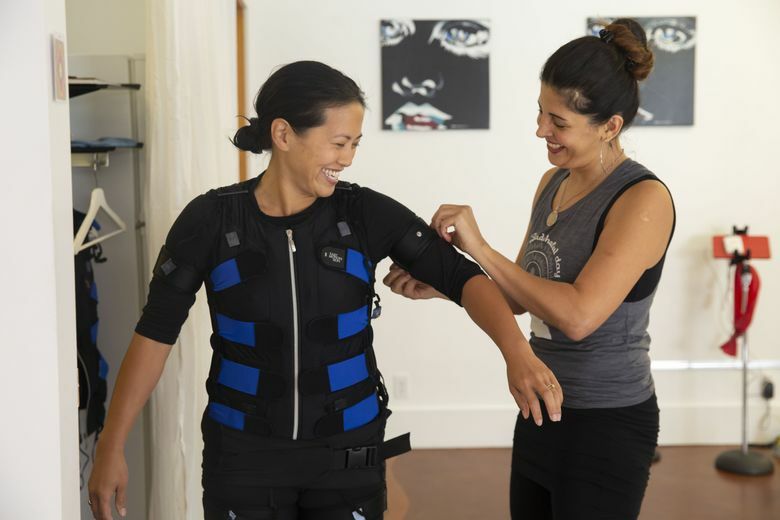 The suit sends electric impulses to your muscles, forcing them to work. Basically, more muscles work the entire time, and you get deep into your muscles. Workouts are short, roughly 20 minutes, but much harder than they seem like they’d be, Mirzanejad says. She instructed me to stand with my legs apart, knees bent, pressing my hands together, before she started the pulses, so I wouldn’t be surprised when they came on. Mirzanejad, who controls the pulses from a tablet, put me on a cycle of six seconds of intense pulses, and four seconds much lighter. The pulses can be adapted for strength training and for cardio. I was surprised at the intensity of the buzzing, especially in my core. My entire body was vibrating, and I was happy for the four seconds when the vibration decreased. I started doing some squats as lunges, as Mirzanejad gradually amped up the intensity of the pulses. During my warm-up, my body was thoroughly buzzed by the suit. We added light weights and twists to my squat hold. I didn’t feel pushed to my edge, though sometimes the buzzing distracted me. I moved to TRX straps for my upper body, working on ring rows, triceps and biceps. The vibration moved up to my arms and my shoulders, and I still felt strong. We went back to lower body. I had a band around my ankles, and did side leg lifts. Here, the pulses felt more intense than any so far, buzzing deep into my muscles. My glutes felt tired, and I struggled to keep moving through the 30-second sets. We went back to the mat for back strengthening on my belly, then I flipped over for bridges. I asked how long we had been going. We were 16 minutes in, and I was looking forward to the workout ending so I could return to delicious quiet in my body. Mirzanejad said it was normal to feel tired by this point. She had me do some bridges with leg extensions, core work and then a few more bridges to finish. The real surprise came after I left. While driving home, I suddenly felt exhausted, like I needed a nap. My body felt the deep tired I get after big, intense workouts, like a hike. Mirzanejad recommends these workouts only twice a week, to give your muscles time to recuperate. The workout makes you strong, and has drawn older clients, who need help activating muscles. I couldn’t tell from just one session whether it made me stronger, but it definitely challenged me, and it was a fascinating way to work out.